• Do you like the way your teeth look? • Do you dislike the color of any of your teeth? • Are there spaces between your teeth? • Do you have any chips or cracks on your teeth? • Are you missing any teeth? • Do you have any crooked teeth? • Do you feel your teeth are too long or too short? • Are you pleased with the shapes and position of your teeth? Your dentist can use natural-colored materials to restore teeth that have cavities. Options include composite materials, such as resin, as well as lab-made porcelain inlays, inlays and crowns. Teeth become stained for many reasons - drinking coffee, tea or wine; smoking; and even aging can discolor teeth. Tooth whitening is a process that makes discolored teeth whiter. The bleach used for in-office (chair side) whitening is stronger than the bleach found in at-home whitening kits. Keep in mind that not everyone's teeth can become movie-star white. Your dentist can recommend the whitening treatment that is right for you. Braces can help correct crowded or crooked teeth or an uneven bite. Braces have become much smaller and less noticeable over the years. Brackets, the part of the braces that attach to each tooth, can sometimes be attached to the back of the tooth to make them less noticeable. Some brackets are clear or tooth coloured-which help braces blend in. Your dentist can "reshape" your teeth by contouring tooth enamel, the outer layer of the tooth. When teeth are a little crowded or uneven, or when teeth appear too long, your dentist can use enamel shaping to improve how the teeth look. 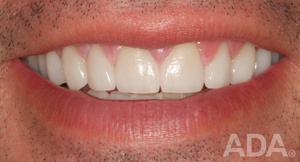 If a tooth needs more a dramatic change than veneers or enamel shaping can provide, crowns are an option. 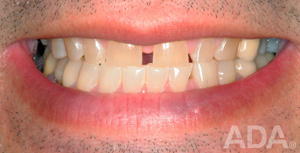 The outer part of the tooth is removed and a crown is placed over it. The crown can be made to fit in with your other teeth. It's like a fresh start for your tooth. Once you decide to improve your smile, the first step is to visit your dentist. At this visit, you will talk about the best plan for you. If you have any signs of dental disease, your dentist may recommend treatment for this. It's important to have a healthy mouth before starting cosmetic treatment. Before-and-after photos courtesy of Dr. John R. Nosti, SmileDesignNYC.com.